Bible Reference: Judges, chapter 11; Hebrews 11.32. Heart of the Story: Jephthah was the son of Gilead (tribe of Manasseh) and a prostitute. Jephthah was reared in the family home until his father died. Then, his brothers expelled him. Jephthah went to Tob, Syria where he became the leader of a group of adventurers. 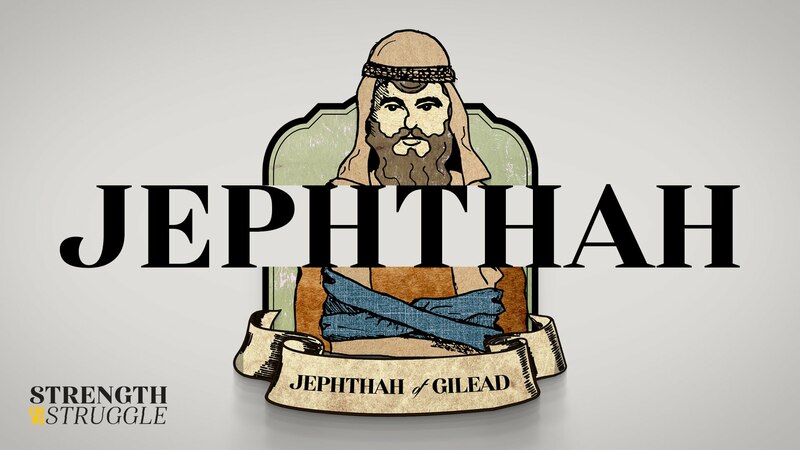 Jephthah is in the Hebrew Hall of Fame (Hebrews 11.32). What Happened: The three Israelite tribes that settled east of the Jordan River were Reuben, Gad and half the tribe of Manasseh. Collectively this area was known as Gilead. At the time of this story, Gilead was overrun by the Ammonite who had suppressed the eastern tribes for 18 years. Although the Bible identified Jephthah as a judge over Israel, he wasn’t appointed initially by God. Unable to find anyone to lead their army against the Ammonites, the Gileadites went to Tob and asked Jephthah to be their commander. Jephthah agreed only if Gileadites promised Jephthah would be both the army commander and leader over them in peace time. He wasn’t about to have his brother’s throw him out again after he fought the Ammonites for them. Jephthah was married but had no sons, only a single daughter. Analysis of Jephthah’s behavior: Before Jephthah engaged the Ammonites in battle, he promised God: “If you give the Ammonites into my hands, whatever comes out of the door of my house to meet me when I return in triumph will be the Lord’s. I will sacrifice it as a burnt offering” (Judges 11:31). After his victory over the Ammonites, Jephthah returned home. The first person out his door was his beloved daughter. The Bible didn’t name Jephthah’s daughter. Immediately, Jephthah was filled with anguish; he tore his clothes in grief. Notably, Jephthah cried out that his daughter made him miserable and wretched because of his vow to God. At no point did Jephthah demonstrate remorse for making a vow that included human sacrifice, an action deplorable to God. His misery and wretchedness was because his beloved daughter would be the sacrifice. Perhaps, part of his misery was because his daughter was the only means for him to establish multi-generation leadership over the Gilead region. Recent Bible commentators suggested that Jephthah didn’t sacrifice his daughter by killing her; but by giving her as a living sacrifice to God. As such, she would have remained unmarried throughout her life. However, nothing in the Bible suggests this option. Conclusion: We aren’t sure how much of Jephthah’s behavior was the result of his birth circumstances; however, clearly the legitimate sons of Gilead felt and showed animosity toward Gilead. Perhaps, Jephthah always felted and acted as if he had something to prove as a result of his birth circumstances. Reflection: Why do you believe that Jephthah was in the Hebrew Hall of Fame in the New Testament? This entry was posted in Fathers & Daughters, Military Captains & Commanders, Prostitution and tagged Bible Study, Gilead, Israelite, Israelite judge, Jephthah, Lesser Known Bible Characters, Manasseh, Obscure Bible Characters. Bookmark the permalink.